When we moved in, the wood paneled family room featured decor of 3 very uncomfortable chairs of various color and style, a love seat, and a TV. It’s become our hang out room, mostly because of the TV. The seating arrangements were not working for us. We’d both try to sit on the love seat at the same time and try and play Mario Kart, but we’d always end up bumping into each other with several limbs falling asleep. When we had friends over, someone always ended up sitting on the floor, because the chairs can’t really be arranged to see the TV. It was not the most comfortable. One Saturday we were out running some errands and Aaron said ” Let’s go thrift shopping and see if we can find a proper sofa for that room.” I initially said no because we haven’t painted the space yet. No point in getting something we’re going to have to worry about covering and moving around. The whole “we could be moving soon pending me getting a job” thing also worried me because that’s one more piece of furniture to either leave behind or get into a moving truck. He somehow talked me into it. We went to the Habitat for Humanity Restore and of course found the perfect sofa. 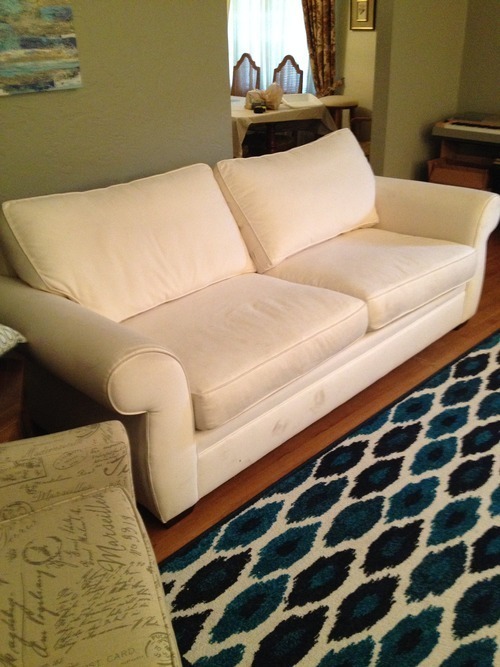 An off white, Pottery barn sofa, with only a few scuffs and dirty spots, for only $50. I looked up the original price online: $1500. You know I love a bargain, especially for something as high quality as Pottery Barn. We measured the sofa and knew it would fit in our truck and in the front door. We did not measure the door into the family room. After about an hour of struggling to try and fit it through the door, we gave up. So now we have a new sofa for the living room. And the grey sofa is in the family room now. It works out well though, because I’m planning on painting that room white. Grey sofa in a white room, white sofa in a grey room. The scuffs came right out with a little scrubbing and the cushion covers were easily washed with the laundry. We also borrowed a relative’s upholstery vacuum to really get it clean. It’s a perfect fit for the space and it was a super great find!